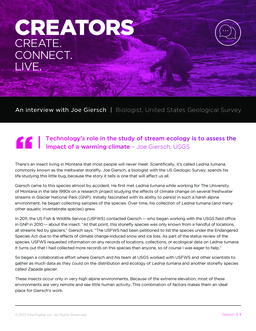 Joe Giersch, a biologist from USGS, sat down with InterDigital to discuss technology’s role in the study of stream ecology, and explain why we should all know about the insect, Lednia tumana, that he has spent his life studying. Recently, the Qualcomm Tricorder XPRIZE® announced its winners. We caught up with Ed Hepler, ex-InterDigital engineer and hardware development lead of the winning bootstrap operation, Final Frontier Medical Devices, after the winning announcement in this CREATORS sit-down.